Chinese foreign ministry spokesperson Hua Chunying said on Tuesday China and the US are working on a summit between the presidents of the two countries, after US media reported President Xi Jinping is set to meet with his US counterpart Donald Trump, possibly as early as next month. The first meeting between the leaders may take place next month in Florida, and analysts said they expect it will set the course for the world's most important diplomatic relationship for the next four years. CNN reported that according to a senior administration official on Monday, Trump will host Xi for a summit in April at his Mar-a-Lago estate in Florida. 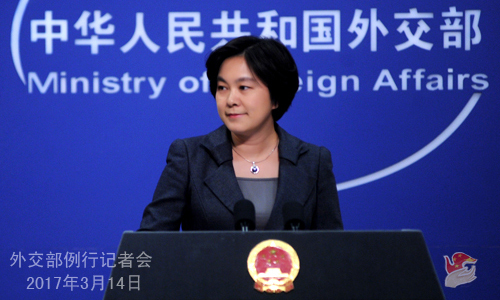 Hua Chunying told a press conference on Tuesday that China and the US are working on a summit as well as other channels for communication. "Both China and the US attach great importance to exchanges at the high-level and various other levels," Hua said. She said the two sides are in close contact on exchanges between their presidents and at other levels, but did not specifically address the upcoming presidential meeting. White House Press Secretary Sean Spicer said on Monday that the White House was preparing for a meeting between Xi and Trump but was not ready to announce a date. "Obviously, both countries agree that a summit between the two leaders needs to be arranged as soon as possible, and whether or not it happens next month, the summit will be a significant step for the Sino-US relationship in the next four years," said Ni Feng, deputy director of the Institute of American Studies at the Chinese Academy of Social Sciences (CASS). Trump's previous remarks on Taiwan, the South China Sea and trade led to concern over the future of the Sino-US relationship, Ni said, "so the release of information about the summit in April is absolutely good news and even a surprise for observers who care about Sino-US relations." This means the course of Sino-US relations over the next four years will be charted sooner than expected by the two leaders without too many difficulties or frictions, Ni added. According to current information, the invitation does not include any event in Washington, DC, so while it is likely to be less formal than a state visit, it might be more productive. "China will hold the 19th National Congress of the Communist Party of China this year and Trump's mission this year is to boost the US economy and push domestic social reform, so both sides share a common desire to ensure stability in the bilateral relationship," said An Gang, a US studies expert and a member of the academic committee of the Pangoal Institution, a Beijing-based think tank. The first Xi-Trump summit will be significant no matter what the form of the meeting is," said Diao Daming, a research fellow at the Institute of American Studies at CASS. There is precedent for a less formal meeting between the Chinese and US leaders. The first meeting between Xi and former US president Barack Obama took place at the Sunnylands Annenberg Estate in California in 2013. This was also not a full state visit, but it served to successfully set the foundation for bilateral relations in Obama's era, An said. US Acting Assistant Secretary of State Susan Thornton had told reporters that Rex Tillerson's upcoming trip to Beijing this week will "to some extent be paving the way for future high-level meetings between our two presidents," Reuters reported. Thornton said the US was "pursuing a results-oriented relationship with China." An said that "results-oriented" means the US will push the Sino-US relationship based on the results or effects of every single instance of Sino-US cooperation. "China has enough experience to deal with the US and we also value the real effect and content of our cooperation, so it's highly likely the bilateral relationship will get off on the right track," he said. News of the summit was announced amid heightened tensions in Northeast Asia, especially created by the North Korean nuclear threat and the deployment of the US Terminal High Altitude Area Defense anti-missile system in South Korea. Diao said he believed that Korean Peninsula issues will not dominate the summit. "The two leaders' first meeting will be very comprehensive and needs to focus on strategic and macroscopic level, not the details. It will include trade, politics, diplomacy, security and so on, and the peninsula issue is not the only security case that both sides need to talk, cases like Taiwan and South China Sea are also important," he said. Michael Pillsbury, director of the Center for Chinese Strategy at the Hudson Institute in Washington and also Trump's advisor for China policies, said in January that "Trump's path of making America great again will go through Beijing." An said this positive voice from Trump's team means China can have confidence in the Sino-US relationship going forward.